The Ruler would be the daily recipient of God's advice, resulting in a rapid growth of Aburiria to heights never before dreamt by humans. "Monolinguism is a recipe for the strangulation of the cultural life of a people," Ngugi wa Thiong'o told about 50 listeners at a reading and book signing on campus Nov. 1, 2006. The book tour marks the English publication of Ngugi's Wizard of the Crow, his first novel in two decades and his own translation from the Gikuyu (Murogi wa Kagogo, 2004–). He read passages from the novel, including one that wrings comedy out of both the pretensions of state power and Kenyans' varying competencies in their mother tongues, the lingua franca of Swahili, and the colonists' English, "the language of education and administration." An exile and former political prisoner remembered in Kenya for, among other things, transforming literary studies at the University of Nairobi—where the Department of English he chaired is now the Department of Literature—Ngugi directs the International Center for Writing and Translation at UC-Irvine. His fictional and dramatic works date from the 1960s in English and the 1970s in Gikuyu. On Wednesday afternoon, he was introduced by his one-time student Dominic Thomas, a UCLA specialist in post-colonial African literature, as "the African writer who should have been awarded the Nobel Prize, before [Wole] Soyinka and [Naguib] Mahfouz, and certainly before [Nadine] Gordimer and [J. M.] Coetzee." The event was sponsored by the UCLA African Studies Center, the Departments of Comparative Literature and of French and Francophone Studies (chaired by Thomas), and the Tusome Book Club. A "global epic from Africa" (Ngugi's label) "too aggrieved and grim to be called satire" (John Updike in a review), the novel is set in the imaginary Free Republic of Aburiria, whose autocratic Ruler demands a tribute from his people to exceed previous wonders of the world and the failure at biblical Babel. Aburiria would now do what the Israelites could not do: raise a building to the very gates of Heaven so that the Ruler could call on God daily to say good morning or good evening or simply how was your day today, God? The Ruler would be the daily recipient of God's advice, resulting in a rapid growth of Aburiria to heights never before dreamt by humans. The entire project, Heavenscrape or simply Marching to Heaven, would be run by a National Building Committee, the chair of which would be announced in good time. 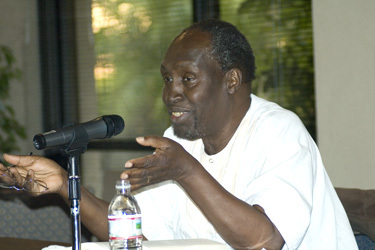 Prompted by a questioner, Ngugi did not object to the use of "magic realism" to describe his novel. However, he immediately turned to Gikuyu and other folkloric, myth-making traditions to explain his transformations of the fantastic into the commonplace. Imagination, Ngugi told the audience, resides at the core of human striving and reasoned governance. "And what is the food of imagination? … Even people who lived in the caves: art was part of their lives." And what is art? The "task" of "any literature" and of painters "is being able to see the magic in the ordinary," he said. In particular, "what the folkloric tradition is doing is recognizing the oneness, the unity behind creation." When Ovid wrote on change, Ngugi said, his Latin epic gestured beyond metamorphoses to "the connection that there is between" animals, plants, mortals, the immortal, and things. All of this helps to explain Ngugi's comment on Wednesday that people who pollute the environment are polluting what is fundamentally human, though in the immediate context he was expressing ideas about romantic love. Setting up for a long passage, Ngugi explained that dictators are "absurd figures," but "at the same time the absurdity meant blood flowing in the countries in which they ruled." UCLA Visiting Professor Wins Prestigious French Book PrizePrix Renaudot winners become "mega-stars overnight" in France.